You know, if there is anything Durarara!! has to teach us, it’s this: Think twice before you fall in love! Seriously. When Celty x Shinra is your healthiest relationship (not really sure if Erika and Walker are together or just good friends . . . and their penchant for team torture might make people question how healthy that relationship is, anyway :p), then that might be a sign for the whole world to give up the entire enterprise, or at least live a little more first. But, no, the Haruna Niekawas (and Mika Harimas) of the world would rather stalk first, and ask questions later. Alas. Maybe it would be OK if they had better taste in men, but of course you cannot help with whom you fall in love. Saika not being an actual human, however, is probably above the rules. Hey, inanimate objects need some lovin’ on occasion, too, right? The cold, sharp pangs of romance’ll hurt anyone if they are felt with enough strength. And Saika expressing its love through vast amounts of slicing and dicing makes about as much sense as anything else in this series. What else can it do, really? You know who would be the perfect match for Saika, though? The old man from Detroit Metal City. The ultimate sadist paired with the ultimate masochist. Is this not destiny? I should be a matchmaker. Move over, Yente. There’s a new Sheriff in town. Going off what a few characters have said in the past about the legend of Saika, the actual sword itself controls people by using pieces of its own soul, perhaps via the conduit of a swordlike object (often a knife wielded by many of those under Saika’s command). But how does this actually happen? Does Saika itself actually need to be in range of a person for Manifest Destiny to occur? The evidence seems to suggest that, no, it doesn’t matter whether Saika itself is anywhere in the area, just as long as someone who has inherited a part of Saika’s soul (a Child of Saika) is there to pass things on (which is why Rakuen’s viral metaphor makes sense). So, really, Saika is not just a strong, ancient sword — it’s also a fantastic delegator! How annoying would it be to have to physically go after someone yourself if you need some help? We cannot always meet people in person; schedules and whatnot are always too damn wonky for this to be practical. So Saika takes care of that by seceding a few people and letting those Chosen Few do their work. Brilliant! Saika itself probably doesn’t choose who are the managers and who are the grunts — people just assume managerial duties based on strength of personality and crazy love, which is why Haruna is high up on the Saika Corporate Ladder. That Saika gives so many people a chance! In this economy, that is a godsend. No wonder so many people gladly work for Saika; promotions are based totally on merit, and the benefits are probably crazy good, as well, as long as you survive. Where can I sign up? Things should be heading off in all sorts of interesting directions now that Saika is flexing its muscles, Shizuo is ready to pound the crap out of the Children of the Saika and Erika is actively shipping Shizuo x Izaya. Wait, that last one probably won’t lead to too many plot points; it does not seem to have tested well with the audience, anyway. Back to the drawing board! This entry was posted on 05/01/2010 at 10:52 am and is filed under Durarara!! 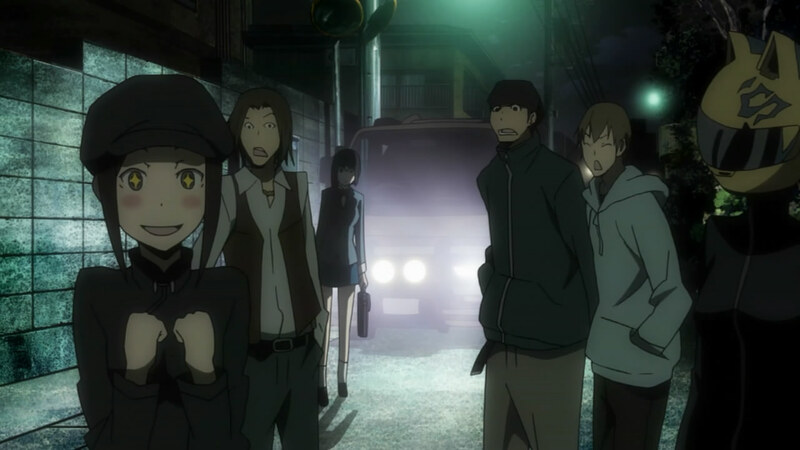 with tags Durarara!!. You can follow any responses to this entry through the RSS 2.0 feed. You can leave a response, or trackback from your own site. Okay, here’s the deal with Anri. Note she always refers to herself as a parasite, even in relation to the sword. A parasite derives benefit from its host, usually at the host’s expense. It never has direct control over the host, but it can influence it on the fringes by impacting its physical health, or something similar. 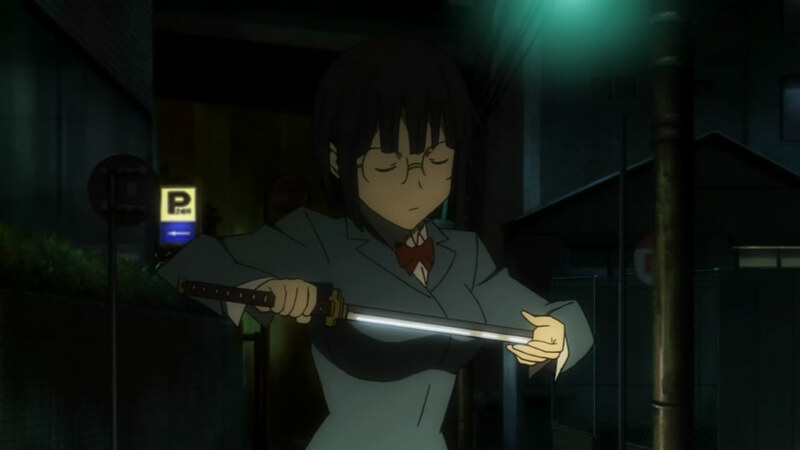 In this case, Anri’s parasitism limits the sword’s abilities a bit. So long as she has the original manifestation, its “health” is limited, at least to some extent. It can still carry out its purpose, but it lacks the benefits derived from wielding the original. 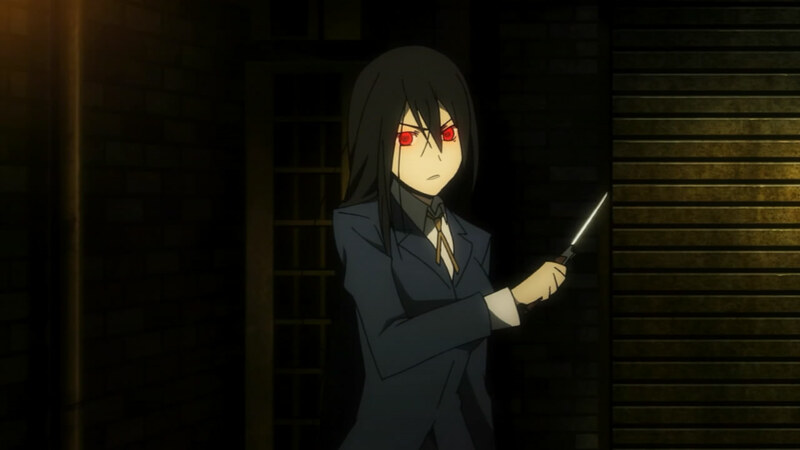 I think rather she just doesn’t want to possess the entire city of Ikebukuro. Whether that’s good or bad is an exercise for the viewer. There are some people that even Saika doesn’t love. Also Haruna talked about feeding it blood. Given her history/personality I think she could be called a “cutter”, so, instead of most people who get stuck once, and then attack other people, Haruna intentionally “re-infected” herself over and over. Perhaps this explains her unusual relation with Saika, to the point where she became a powerful new disease vector. What a creepy explanation. Haruna’s taking the blood oath a bit too literally! I just assumed that Anri kept Saika under wraps except for when it was time for a little demonic self-loving. Saika believes in the wisdom of aggregate market forces. … That seems like it might hurt just a tad. And, yeah, Saika is just taking advantage of Japan’s hypercapitalist society.